Neoss® offers a simple and reliable solution of implant-supported bars, bridges and abutments, which, in addition to the proven Neoss Implant System, are compatible with implants of other manufacturers. Scans and designs are communicated to the Neoss Scan Center. Registration is required to use these services via www.neoss-cadcam.de. Once you are registered you can download instruction manuals and libraries from the site. Local milling using Neoss blanks is offered as a solution for single abutments. All individual abutments are produced from pre-made blanks for highest accuracy. Neoss offers Model Analogs for use with printed or milled models from external sources. 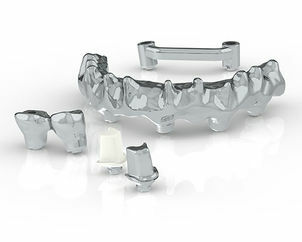 Neoss Model Analogs are incorporated in the libraries provided by Neoss for 3Shape, Exocad and Dental Wings (available for download at: www.neoss-cadcam.de).